On the night of August 19th, two pugilistic levels of potential played out about 1000 miles apart. In Lincoln, Nebraska WBC and WBO junior welterweight champion Terence Crawford looked to capture all of the 140 pound titles in a unification bout with IBF and WBA junior welterweight champion Julius Indongo. 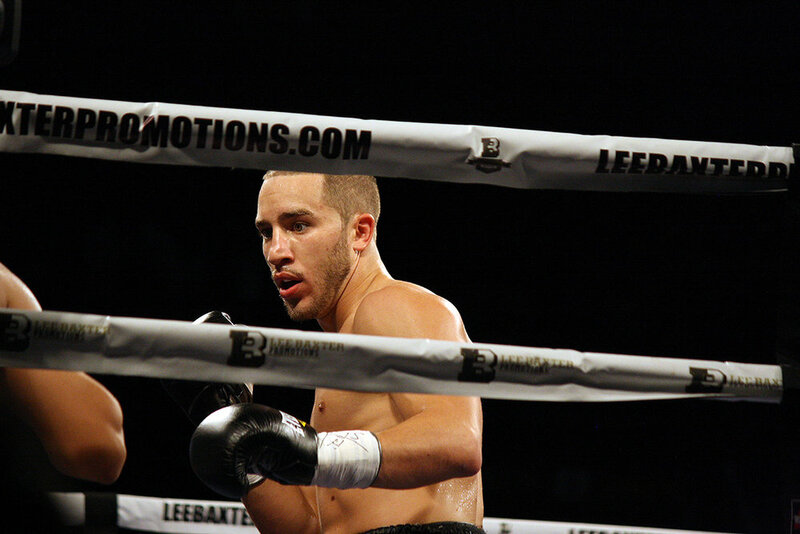 While in Brampton, Ontario WBA-NABA welterweight champion Sam Vargas defended his title against former world champion Ali Funeka on a card promoted by Lee Baxter Promotions. While the events in Nebraska represented the culmination of a certain potential realized, the events in Brampton were another positive step on the long road towards fulfilling what might potentially await. As a suburb of Toronto, Brampton is the type of place that thins into farmland and new housing developments when one ventures beyond a certain point. Yet one of its more metro sections is home to the Powerade Centre; a sporting facility featuring a 5,000 seat arena and event space. When arranged for boxing, the arena somewhat resembles the boxing setup at the Turning Stone Casino and Resort in Verona, NY. One level of bowl seats around the arena and ample floor space for tables or floor seating around the ring. As a cozy establishment there is not a bad seat to be had in the place. The Powerade Centre has seemed to become an important part of Lee Baxter and Lee Baxter Promotions quest to build a consistent boxing presence in the Greater Toronto Area. As a venue that is not too big yet not too small, it would seem to be a good barometer of where Baxter’s efforts stand in terms of selling tickets and turning his fighters into local draws. Yet Baxter also realizes that in order for his fighters to continue to move forward towards realizing their potential, new and improved broadcast and viewing options for local fight fans are needed. At the 9am, same day weigh in for Vargas-Funeka, Baxter relayed to me just some of the plans he was working on for broadcasting his cards on television in the future. Targeted advertising, new channels, and additional fighters were all in the works. Keep in mind that the current Canadian TV boxing landscape looks something like this: HBO fights in many regions of the country are tape delayed, not live. Top Rank’s new ESPN cards are broadcast on a channel that you have to pay extra for. This despite the fact that the ESPN associated channel in Canada (TSN) frequently shows the same broadcast simultaneously on three or four different channels. Want to watch an ESPN 3 stream? Forget it, won't work. And oh yeah, if a Quebec based fighter is fighting on a card in the country the fight goes automatically to PPV - even if the fight is on HBO. Any kind of order that could be brought to this madness would be welcome for boxing fans north of the U.S. border. For Vargas-Funeka, Baxter utilized Fite.tv to broadcast the event. However, it seems he has eyes on shoring up a consistent (and affordable) future TV option for his efforts. 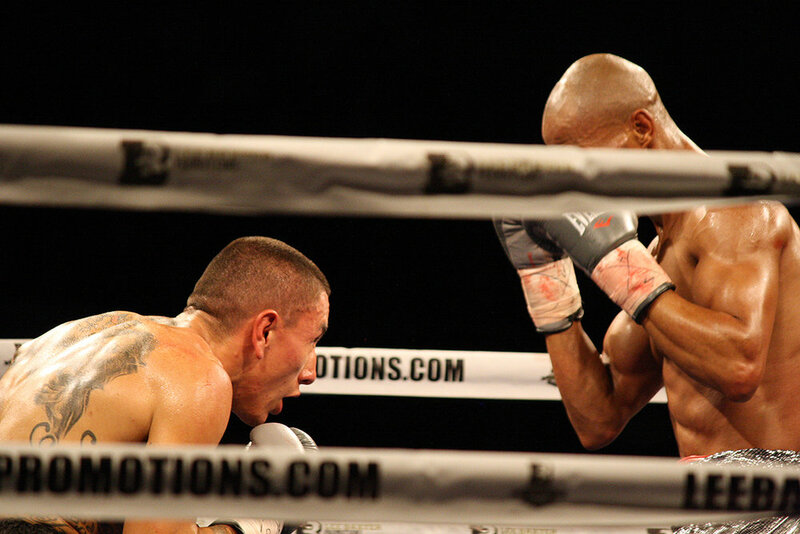 Three of Baxter’s local fighters (including Sam Vargas) were on display the evening of August 19th at the Powerade Centre. 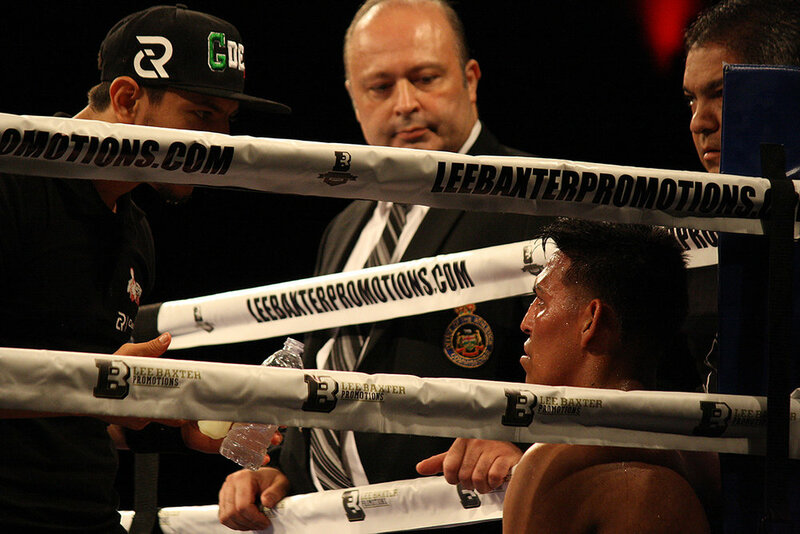 Sturdy welterweight prospect Kane Heron forced his opponent Cesar Chavez to retire on his stool. While hulking heavyweight prospect Mladen ‘Monster’ Miljas destroyed Hector Aguilar in less than a round. Crowd support was loud for both fighters as they each looked to build their local following. Heron moved his record to 8-0 (4 KO’s) while Miljas improved to 6-0 (6 KO’s). 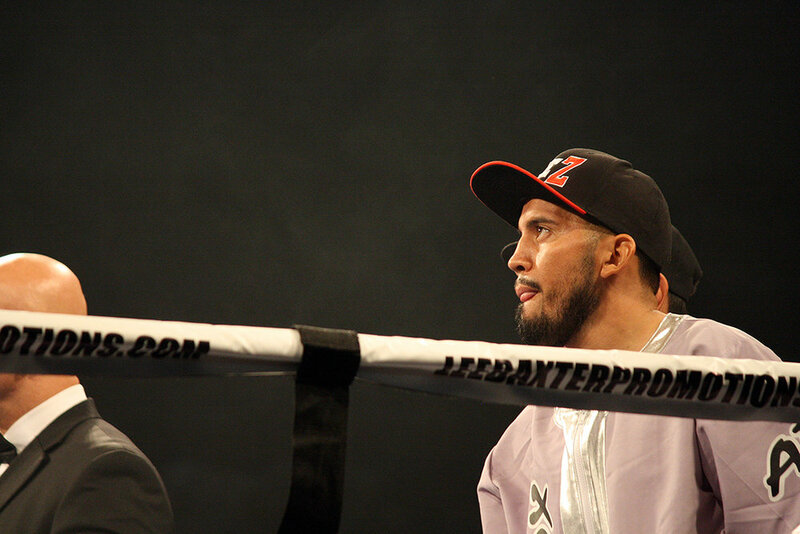 In the main event, Sam Vargas walked out to strong support with his trainer Billy Briscoe. Ali Funeka walked out proudly with the South African flag, and looked determined despite fighting on his opponent's home turf. As they faced off in the center of the ring, Funeka (6’1”) towered over the smaller Vargas (5’9”). The 10 round clash proceeded to smoke but never really caught fire as neither man was seriously hurt or wobbled. Vargas pressed the action inside and was busier; landing shots to Funeka’s mid section. Funeka’s age (39) was definitely a factor, though he acquitted himself well; engaging and looking to hold his ground. Of the three judges scoring the bout, one gave almost every single round to Vargas (which was too much). Another scored the fight a draw. While the third gave Vargas the nod by four rounds (which seemed correct). Usually, a night of fighting entertainment ends with the conclusion of the main event. Yet as I left my ringside table at the Powerade Centre amid the empty beverages and tipsy fight fans; I knew the night of boxing was not entirely finished. I had purposely cut myself off from any Terence Crawford news in order to watch his title unification bout on DVR without any advance knowledge of the outcome. Crawford’s fights in his home state have become a worthy television spectacle, and I had a feeling this one would not disappoint. Crawford’s entrance to the ring alone seemed to validate my viewing assumptions. The hometown hero waded through the crowd almost as if to draw strength from his adoring fans. A Crawford fight in Nebraska is a very authentic thing - it is not just a sporting event, it is a human event. An event where love, affection, and community manifest themselves in the form of a boxing match. This seems to be a rare occasion in the United States these days; yet it does seem to happen with more frequency in the United Kingdom. From the opening bell one could see that it was only a matter of time that Crawford’s opponent (Julius Indongo) would meet a certain fate. Seemingly rattled by the moment, the surroundings, and the man in front of him - Indongo looked to be overmatched. And so it was, in the third round Indongo melted into the canvas after a vicious body shot by Crawford. The referee would count to ten, Crawford would make an iconic leap of joy, and the camera would pan out to capture all of it - including the hometown crowd in jubilation. If it was movie, you would be hard pressed to script it any better than that. This moment was of course not the end of Crawford’s career. However, it did seem to mark the culmination of a part of Crawford’s journey with his promoter Top Rank. It was potential fully realized on a night where everything came together. And for those that doubt - yes, belts matter, unification fights matter, and special moments matter. These things help bring the sport to its highest level, and this is why we watch - at least it used to be. Sometimes I wonder if maybe we are just too far gone as a culture to appreciate authentic moments when they happen. As I reflected on Crawford’s achievement it dawned on me that what transpired in Lincoln, Nebraska on August 19th is probably exactly what Lee Baxter would strive to see happen years from now in Toronto. A moment where all the hard work, despite the trials and setbacks, culminates into something special. His fight card at the Powerade Centre featuring Vargas-Funeka was another step in that direction. In the fight program for the event, Baxter penned an open letter thanking the fans for their continued support. The first line of the letter read, ‘They say it takes a village to raise a child. Well, in the boxing world, it takes a city to raise a fighter’. This was certainly proven to be the case for Terence Crawford in Omaha, Nebraska. We can only wait and see if it will one day prove to be true for a young man from Toronto, Ontario.